This we see being accomplished through what we call our EAGLES vision. The school has four character cornerstones comprising of Mercy, Humility, Wisdom and Justice which underpin twelve core values. 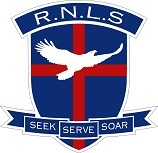 Our Crest incorporates the shield - symbolic of faith, the blood red cross – symbolic of salvation through Christ's sacrifice, and the white eagle in flight standing for our EAGLES Vision and soaring for Christ. But those who hope in the Lord will renew their strength. They will soar on wings like eagles; they will run and not grow weary, hey will walk and not grow faint. To SEEK means to seek truth, to experience God's grace and to discover who Jesus is. To SERVE means deciding to put others before ourselves, learning the meaning of empathy. To SOAR means to aim high in all things, and to become a mature, balanced person.